Q: You could have chosen to practice any where. We're lucky, but why choose Jackson? A: Jackson is my hometown. And I love Mississippi. I was so fortunate to have the ability to practice with some of the finest surgeons in the country at the University of Kentucky. The experience was simply unparalleled and I want to share that with my home state. 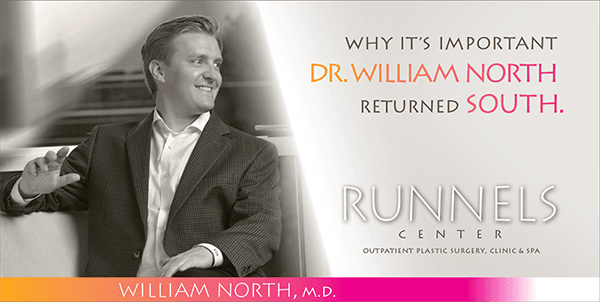 I feel truly honored to become part of a practice here at the Runnels Center, with their strong reputation of excellence and service in Plastic and Reconstructive Surgery. Q: You had a chance to observe Dr. Runnels while you were in med school. Can you give some details on your first meeting? A: I'll never forget it. It was the summer after my first year in medical school. I had the opportunity to observe Dr. Runnels for a day at both the Runnels Center and River Oaks Hospital. After graduation from medical school, we still kept in touch and have continued to be friends over the years. Q: So, any details on family or what you like to do in your downtime? A: Well, my wife, Kelsey, and I are both looking forward to becoming active in the community. In my spare time, I enjoy outdoor activities like jogging, boating, hunting, and fishing. Click here for Special Introductory Offers & Discounts from Dr. North for new Runnels Center clients! These are only available for a limited time, so schedule your appointment by calling 601- 939-9778. Follow Dr. North on Instagram!